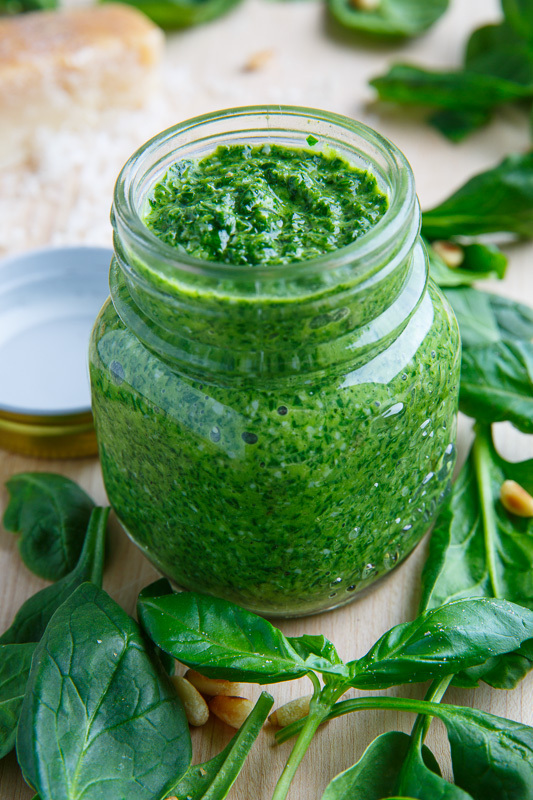 A quick, easy and fresh homemade pesto with baby spinach for flavour and a kick of healthy goodness. Tired of regular old basil pesto? (I know, I could never get tired of basil pesto either, but it’s always fun to change things up a bit every once in a while!) How about a spinach pesto which has all of the healthy benefits of spinach while still retaining basils summery pop! This spinach pesto is just as easy to make at home as regular pesto where you simply throw everything into the food processor and puree! You can use this spinach pesto as a sauce in pastas, as a condiment in sandwiches, as a dressing for salads and much more. The next time you reach for that jar of pesto think about using a fresh homemade spinach pesto instead! Puree everything in the food processor. All the flavor with all the health benefits thanks! I love making different kinds of pestos. This one is so bright and vibrant! I love it! Arugula also works great for pesto!